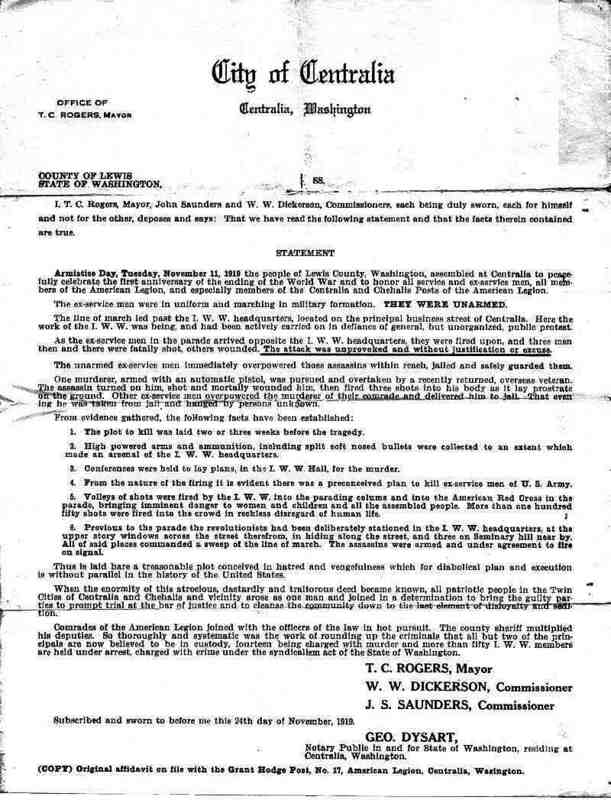 Pictures and details of Emil Remmen's National Guard unit involvement following the Centralia, Washington, Armistice day killings of Tuesday, November 11, 1919. On Armistice Day, Tuesday, November 11, 1919, during a parade in Centralia, Washington, a riot erupted that resulted in gunfire, killing four veterans recently returned from the First World War. Vigilantes rounded up anyone thought to be involved in the shootings, put them in jail, and later that day lynched one of them. Apparently the International Workers of the World (the IWW, or Wobblies) had set up office in Centralia, Washington, with the intent to organize the local labor forces. This was opposed by the wealthy timber barons who made every attempt to drive them out of town. On Memorial Day in 1918 during a parade that included the Governor of Washington, the Mayor of Centralia, and other dignitaries, the IWW hall was attacked. The IWW office was destroyed and the workers were beaten and told to leave town. Instead, they opened a new hall and continued their efforts toward improving the living standards of the working class. 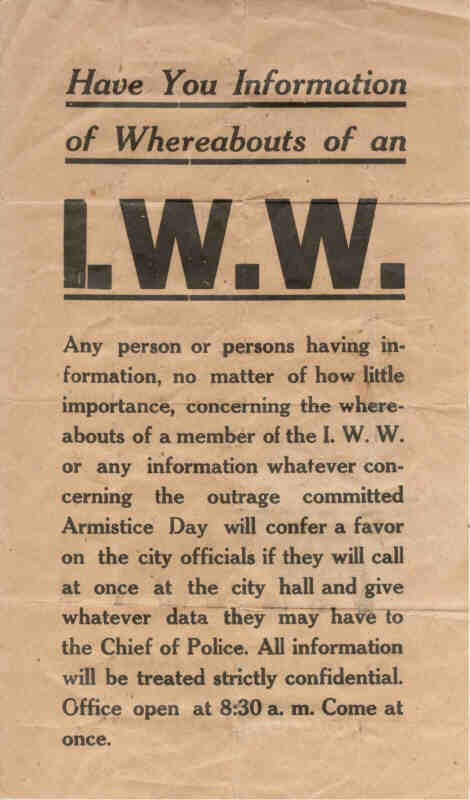 The next year a rumor was circulating that the IWW hall would again be attacked, this time during the Armistice Day parade. 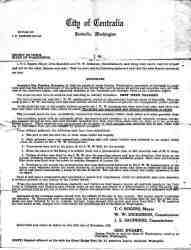 The IWW workers were determined to defend their rights and property, and on the advice of their lawyer did so. When the Armistice Day parade stopped in front of the IWW hall, the people inside were armed and ready. The hall was attacked, mainly by ex-servicemen who were now organized under the American Legion. As the attackers broke out the windows and kicked in the door, the armed I.W.W. members fired on them from inside the hall and from a near-by hillside. As a result, several of the attackers were either killed or injured. Wesley Everest, who was one of the armed IWW members defending the hall, ran out the back as he was being chased by a mob. He shot three of the attackers, and killed at least one of them before he was caught, beaten, and dragged by the neck to the jail. Once there, he was thrown in along with the others that had been caught. Later that day word was received that several of those shot by the IWW members had died. This inflamed the community even more. The jail where the prisoners were being held was surrounded by a large crowd of up to a thousand men and women yelling and cursing at the prisoners. Later that night all power went out in Centralia, and in the darkness Everest was taken from the jail and hung by the neck from a bridge across the Chehalis River (the Mellen St. Bridge). It was also rumored that he had been castrated, but that was probably just part of the wild hysteria associated with the event. After the lynching, Everest's body was shot about 20 times and then left hanging. The next day it was cut down, taken back to the jail, and dumped inside with the rest of the prisoners. The mob action continued into the night of February 11th, as the vigilante groups continued to hunt down suspected Wobblies. People were beaten, homes raided, and suspects rounded up and thrown in jail by the angry mobs. As a result of this situation, the Washington National Guard was called in by Governor Hart to restore order and prevent any further lynchings. Company F of the 3rd Washington Infantry, including Emil Remmen, was sent to Centralia by train on the evening of the 11th from Fort Lewis in Tacoma, Washington. On the 13th, Everest's body was removed from the jail and examined by a contrived coroner's jury, which included no witnesses. The jury made the ruling that Everest had died of gunshot wounds and strangulation by persons unknown. Since the local officials refused to bury Everest, the task fell to four of the prisoners from the jail. They were given the job of constructing a casket from rough sawn lumber. The body was placed in the wooden box, and loaded into one of Jim Lynch's moving vans, which had a sign that read "Lynch, for quick work call us." Seventeen armed National Guardsmen (including 19 year old Emil Remmen), along with the four IWW prisoners from the jail, escorted the van to the local cemetery. Once there, the four IWW prisoners dug a grave and buried Wesley Everest, whose final resting-place was an unmarked grave in the pauper's section. The National Guard continued to guard the jail and to maintain order in the town. On the evening of the 16th the National Guard unit was relieved of duty, and returned by train to Tacoma. Later, the I.W.W. members who were accused of murder in this case, were railroaded by a trial that made a mockery of justice through lies, intimidation of witnesses, and suppression of evidence. Sent to prison for many years, the story of their plight is an interesting though tragic one. You can read more about this tragedy here and here. For a detailed account of this event and the trials that followed, see the book Wobbly War; The Centralia Story, by John McClelland, Jr., published by the Washington State Historical Society (should be available at, or by loan through, your local library). 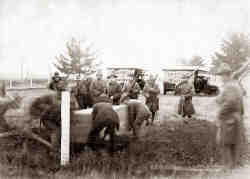 The burial of Wesley Everest, with armed National Guard unit. The casket is being lowered into the grave by the IWW prisoners from the jail, with the Lynch moving vans in the background. Emil Remmen is in back, far right, facing the camera. Subject: National Guard Service at Centralia, Wash.
1. In, compliance with telephone instructions received from The Adjutant General at 6:15 P.M. Tuesday November 11th, 1919, Capt. Shurtleff was ordered to immediately assemble Company F 3rd Wash. Infantry for the purpose of entraining for Centralia, Wash. Officers and enlisted men were instructed to take full field equipment, 100 rounds ball ammunition per man, and to entrain at Union Station Tacoma as soon as approximately forty man had reported. 2. Received instructions to personally supervise the movement of troops and to proceed with them to Centralia, assuming command on arrival at that point and to cooperate with the Civil authorities in restoring and maintaining order and enforcement of the law. 3. Company F, 2 officers and 35 enlisted men, left the Tacoma Armory at 10:10 P.M. Captain Thomas L. Shurtleff in command, entrained at 10:20 P.M. on Special Train which left at 10:25 arriving in Centralia at 11:35 P.M.
4. On arrival at Centralia a conference was immediately had with Major Rogers and Mr. Christensen Assistant Attorney General. The conference disclosed the following situation: During the afternoon of November 11th while a parade of The American Legion was in progress, the line was fired upon by a number of Industrial Workers of the World. Four returned service men being killed and a number wounded. Several of the I. W. W. had been captured before our arrival and at about 7.00 o'clock P.M. one these had been taken from the City Jail and 1ynched by a party of infuriated Citizens. 5. The troops were detrained and proceeded to quarters which had been provided at the rooms of the Centralia Chamber of Commerce. Capt. Shurtleff was instructed to hold them in quarters for further orders. 6. Further conference with State, County and City officials and discussing the situation with a number of prominent citizens developed the fact that the citizens, generally, were in a dangerous mood and that there was a strong possibility of further trouble unless great care was exercised in handling the situation. 7. At 2:30 A.M. the Mayor and Chief of Police requested that a Military Guard be placed at City Jail and this was promptly furnished. Lieut. Miller who had just arrived with 17 additional men was detailed by Capt. Shurtleff to perform this important duty with about one-third of the Company as an Outpost, quarters being provided in the Bank Building adjoining Jail and about four blocks distant from Chamber of Commerce where headquarters had been established. 8. Lieut. F. S. Boston with 3 enlisted men from the Regimental Infirmary arrived and reported at Headquarters at 2:15 A.M.
9. At 3:30 A.M. Outposts were established at five points where thoroughfares enter City, instructions were given to examine all persons entering or leaving the City, and to hold for examination all suspicious characters. As a result of this several persons having in their possession I. W. W. Membership cards were detained and turned over to Civil Authorities. At 2:30 A.M. November 13th, firing occurred at outpost #5 (see map attached) one of the sentries reporting that he had been fired on from cover of the woods and returned the fire. A thorough search of the vicinity however, failed to disclose anything of a suspicious nature. 10. On request of the Sheriff, an armed guard was placed at the County Jail, Chehalis, at 8:00 P.M. November 13th, it being rumored that an attack was to be made on the Jail for the purpose of liberating prisoners. This guard was relieved on the morning of November 14th. 11. At 8:00 P.M. November 14th, The Adjutant General, Judge Reynolds of Superior Court, Sheriff Berry and The Commissioners of Lewis County held a conference in the Chambers of Judge Reynolds at which it was decided that the Civil Authorities would be prepared to relieve Military Guards at 6:00 P.M. Sunday November 16th. This arrangement was agreed to by Mayor Rogers of Centralia on November 15th. The Troops were relieved and entrained for their home stations at 7:30 P.M. Sunday November 16th. a. November 13th, on written request of County Coroner to assist in burial body of party who was lynched, this detail consisted of an armed guard for prisoners who were required to perform the work. b. Military Police for clearing streets on November 14th during funeral of the four men who were killed. c. Guard at Auditorium on day of funeral. d. Four firing squads for funeral services of American Legion Men on November 14th, 15th and 16th. 13. Map showing location of headquarters, Jail and outposts attached also written request of County Coroner before referred to. Report of Medical Officer has been submitted direct to headquarters. 14. Morale of troops was excellent, both Officers and enlisted men are commended for their conduct under most trying conditions. Signed: H. G. Winsor, Lieut. Colonel 3rd Wash. Infantry N.G.